In a speech Director General Mark Thompson plans to say that the internet attack coincided with efforts to jam two of the service's satellite feeds into Iran. He will say: "We regard the coincidence of these different attacks as self-evidently suspicious." Last month Mr Thompson accused Iran of intimidating Persian service workers. Reporters Without Borders has also complained about Iran's "cyber-army". The latest revelation follows ablog post by Mr Thompsonin February in which he complained of the "repeated jamming of international TV stations such as BBC Persian TV, preventing the Iranian people from accessing a vital source of free information". In his speech to the Royal Television Society he will note that on the day of the cyber-attack there had also been an attempt to disrupt the Persian Service's London phone-lines by the use of multiple automatic calls. "I don't want to go into any more detail about these incidents except to say that we are taking every step we can, as we always do, to ensure that this vital service continues to reach the people who need it," Mr Thompson will say. Some parts of the BBC were unable to access email and other internet services on 1 March. It is understood that the attack may have been caused by its systems being overwhelmed by a flood of external communication requests - a so-called distributed denial-of-service attack. 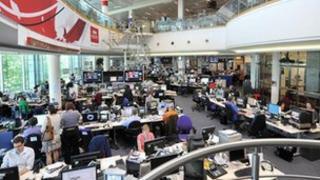 However, a BBC spokeswoman was unable to provide detail about the incident. "I'm afraid we can't comment any further on the details of the attacks than what's in the extract [of the speech]," a she said. The revelations follow Reporters Without Borders"Enemies of the Internet" reportwhich was released at the start of the week. The free-speech lobby group reported that Iran and some of the other countries on its register "censor internet access so effectively that they restrict their populations to local intranets that bear no resemblance to the world wide web." It added that Iran's authorities were now capable of blocking ports used by virtual private networks designed to bypass the restrictions. It also reported that at times of unrest the state had slowed internet connections speeds to make it impossible to send or receive photos or videos. Iran's Revolutionary Guard created a "cyber army" in 2010. Hundreds of net users have been arrested and some even sentenced to death. Earlier this month the country's Supreme Leader, Ayatollah Ali Khamenei, also ordered officials to create The Supreme Council of Virtual Space - a body tasked with defining policy and co-ordinating decisions regarding the net. Iran's Ministry of Foreign Affairs did not reply to a request for comment.